We had quite a bit of snow last week, so one day after taking care of the morning's chores, I went on a walk with my camera. Sylvester followed along and we got some shots that we wanted to share (go here if you'd like to see more photo posts). We hope you've enjoyed a slice of our snowy homestead! You received quite a bit of snow. Looks lovely! Such artsy shots - I love them. You guys got about the same amount of snow that we did, but my poor sister in law down in CT got nearly 18"! Eeeek. I envy your snowy woods. Our flat plains let it blow away. What lovely photos of that beautiful and deep snow. Wow...like Jeannie Clemens said, our snow usually just blows away...however, seldom do we get as much as you got. Love the chicken on the snowy fence! What beautiful photos! Looks like a lovely winter walk. It's amazing how the snow can change the terrain so completely! Do hope that you don't have to go out in it, but can enjoy it from inside!! Could have easily been a walk around our place -- even the red pump is the same! The barn looks so pretty against the snow! I can only imagine what your surroundings look like in person. It looks stunning! So many frame-worthy shots! Hope you're nice-n-toasty! Winter is such a peaceful time. The white chicken and white snow.. they look so pretty together! I like the way the tree trunks look with the snow. Very pretty walk around your homestead! Love the cute chicken! I wish you all the best in 2013. Happy New Year to you and your family! Your kitty doesn't seem daunted in the least by the snow! Great pics, and happy new year to you! felines who decided to venture out onto the fresh new white world..of course I follow as they are indoor babies.I'm lovin g my visits!Glad that we connected! Beautiful! Thanks for sharing. I love the fence pic. Happy New Year! Simply beautiful my friend. So glad we met this year..
Beautiful! It was to cold here for me to go for a walk, wish I was tougher so I could have enjoyed the beauty of it! Beautiful photos! Thank you and Sylvester for them. I love winter for how pretty it makes everything look, every season has it's own beauty. Some just less cold than others! Your post just made me sigh with longing for the beauty and serenity, and a couple of the photos made me laugh (the guinea hen? 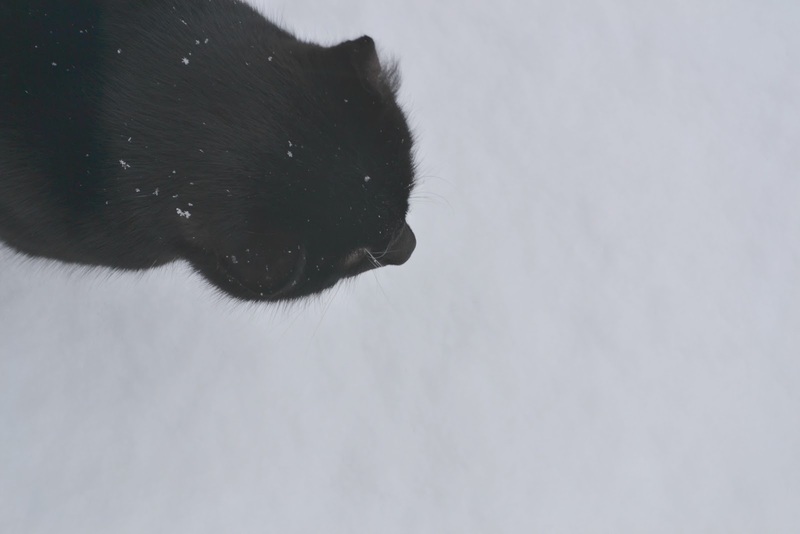 and cat in snow)....happy new year! Looks like our outdoors here in NH! Love your pics as always and your new header!!! I don't mind the cold or most of the snow, I just don't like the ice on the driveway or roads. Nice photos - snow is always so pretty to see. Love your pictures! What a beautiful place to live. It's a different view than what I see outside my door. It seems other-worldly to see snow. I love the images and especially the contrasts and between snow and the other characters and things in the landscape. Beautiful! Gorgeous pictures Tammy, and I am SO envious of all that snow! Please can I come and stay next winter?! It's so pretty when the snow is clinging to the tree branches. I can't imagine how the cats walk through the snow without freezing their little feet! Mine do it too, even follow us around. Quite stunning how snow changes a place. You've captured it beautifully! Wow ! !that is sure a lot of Snow , Great pictures . Thanks for sharing these wonderful photos on the Winter on the HomeAcre Hop! Sylvester is such a cute kitty and he looks so regal in the snow! Sharing yours and Sylvester's walk makes me smile. Love the way a blanket of snow can make even the most commonplace scene magical. Sylvester surprises me--is it unusual for a cat to like snow? Only dogs around here! I'm surprised Sylvester was out following you through the snow. Mine wouldn't. Lovely shots you shared. Great pictures! Thank you for joining Home Sweet Home! Beautiful pictures of the snow at your homestead!! Visitng from the Country Whites Weekend. Hi, just came from Cindy's party.